Adorable roly-poly bear guzzling out of a honey pot! Measures 2 1/2″ by 2″. 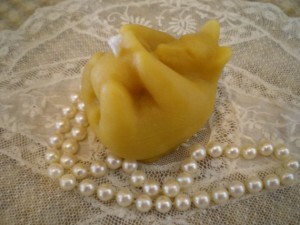 Pure beeswax and 100% cotton wick. Please indicate whether you would prefer the natural gold or the soft white beeswax.